Buy Aroma Magic Help Me! 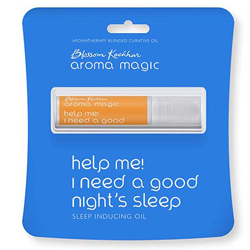 I need a good night's sleep - Sleep Inducing Oil - Give you a good night’s sleep. Give you a good night’s sleep. Aromatherapy formulation made from essential oils of sandalwood, vetiver and sweet marjoram. Potent blend of pure and natural oils helps to ease your tired body and soothe your mind to give you a good night’s sleep. You wake up fit, fresh and happy. Safe and natural with no side effects.